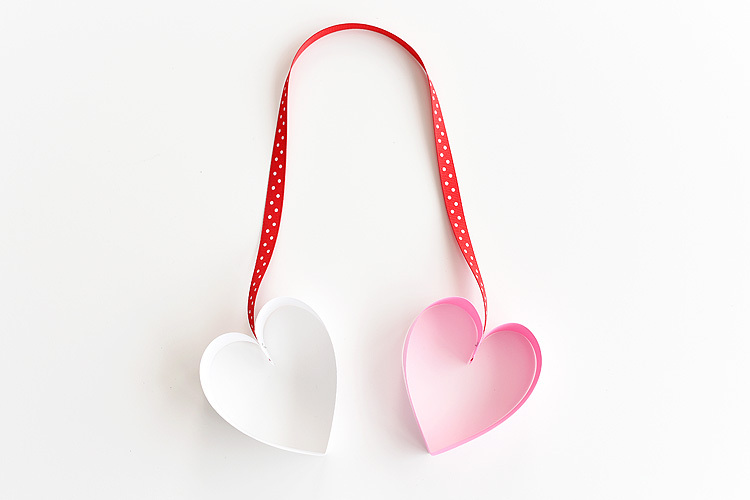 These stapled paper heart wreaths are so simple to make and they look adorable! 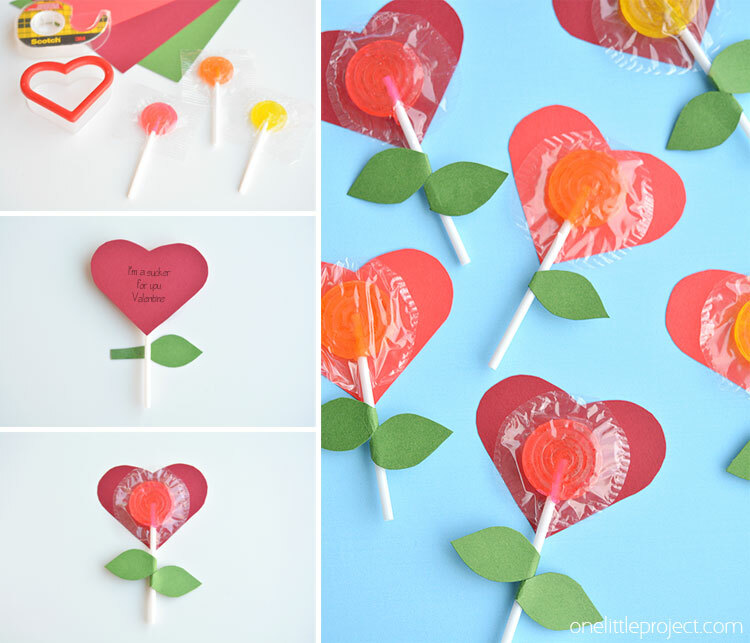 They’re a fun and easy Valentine’s Day decoration that the kids can make at home, or even at school! It only takes about 10 minutes to make the whole wreath and it’s easy enough that kids should be able to make most of it by themselves. 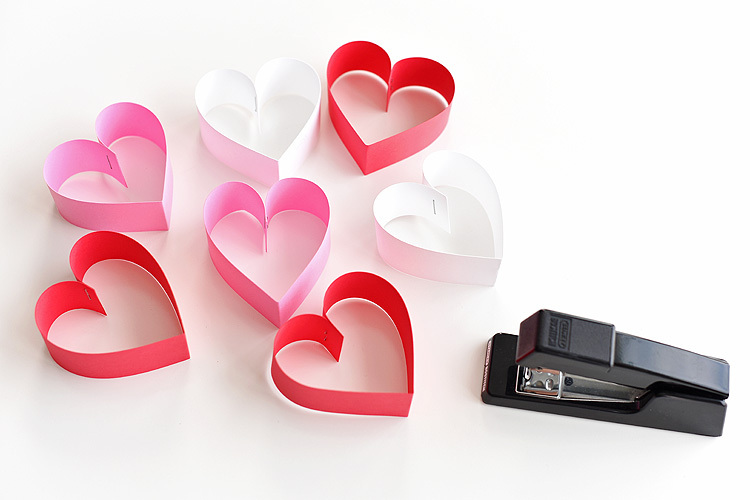 Who knew that making paper hearts was so easy!? The other night at dinner my 8 year old daughter asked, “Mommy, are we going to celebrate Valentine’s Day?”. For some reason I didn’t know how to respond to that question?? What I was thinking was, “Sweetheart, we just finished Christmas, and you still have a big bag of Halloween candy on the top shelf in the closet, so NO, I AM NOT going to buy you a box of chocolates for Valentine’s Day”. Instead I said, “I don’t know honey, maybe?” lol The classic, I-don’t-want-to-talk-about-it mom response. And being the awesome mom that I am, I quickly changed the subject. Do you celebrate (or maybe “celebrate” in quotations would be more appropriate?) Valentine’s Day with your kids? We send (store bought) Valentines to school each year, but other than that, things are so busy and hectic at our house that I barely get to celebrate Valentine’s Day with my husband, let alone with my kids! Since we are such a craft loving family, I had to make at LEAST one Valentine’s Day craft for the kids! If something is fast and easy, then I’m totally on board! And even better if it doesn’t involve candy! 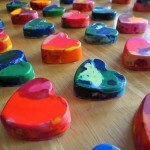 So if you’re looking for a fun and EASY way to celebrate Valentine’s Day with your kids, go ahead and give this craft a try! It’s really simple to make, it’s fast enough that it will keep the kids attention, and the best part – there’s no sugar involved! 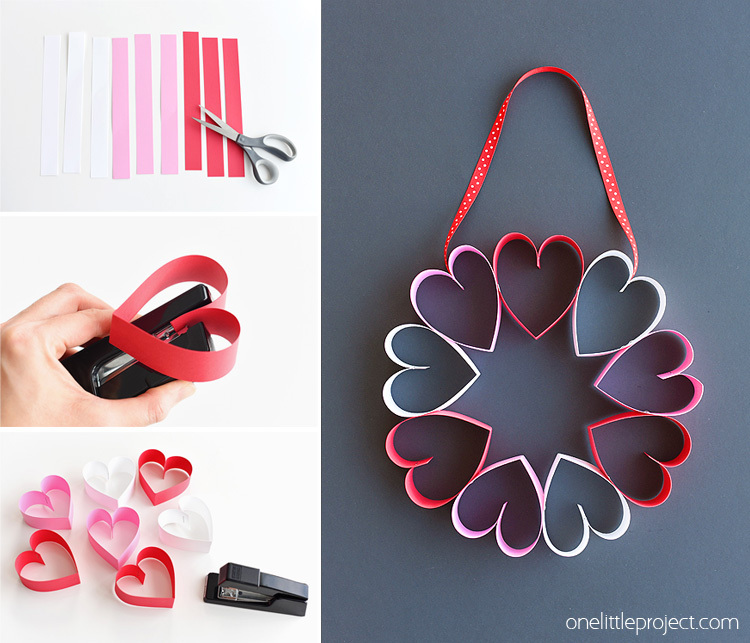 I used red, pink and white paper for Valentine’s Day, but you can make yours whatever colours you like! I really looooove the rainbow colours of the paper heart wreath made by hello, Wonderful! 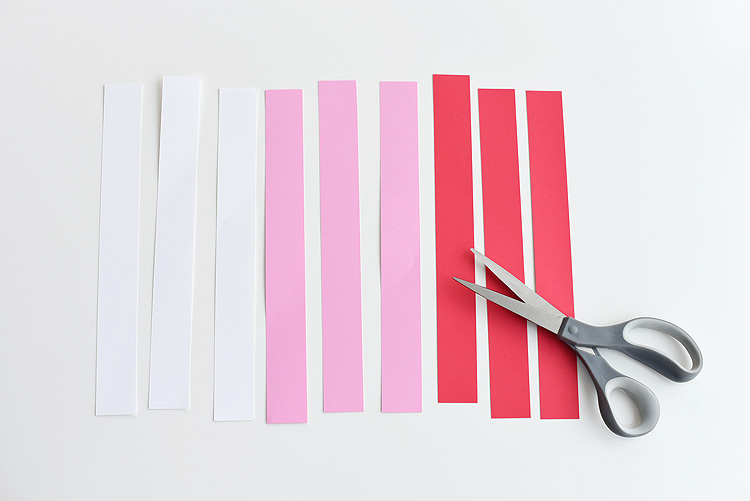 Cut out 9 strips of paper about 1-1/4″ wide by 11″ long. Each strip of paper will become one heart in your wreath. If you add more than 9 hearts to your wreath it will start to get a little droopy. 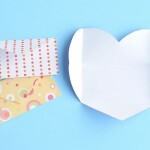 Curve the ends of the paper inwards to make a heart shape and staple the two ends to hold it together. I used a regular sized stapler, but if you have a smaller stapler, it would probably work even better. How easy is that to make a perfect heart shape!?!? If you plan to hang up your wreath, you’ll want to attach a ribbon to hang it from. 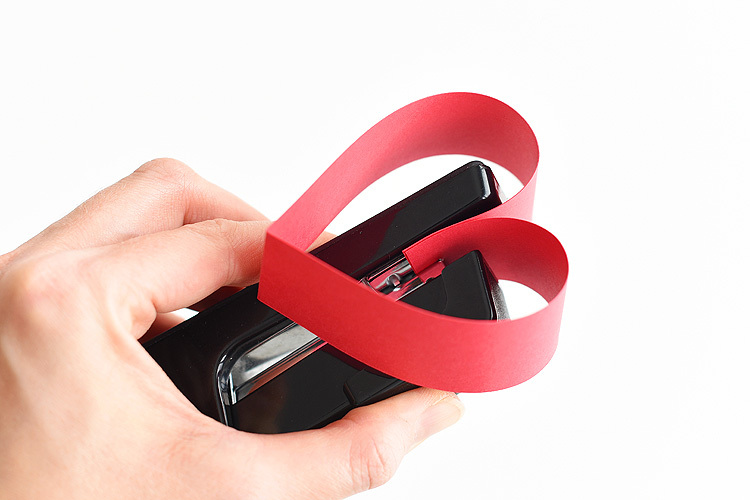 I find it looks nicest if you staple the ribbon right into the middle of two of the hearts. 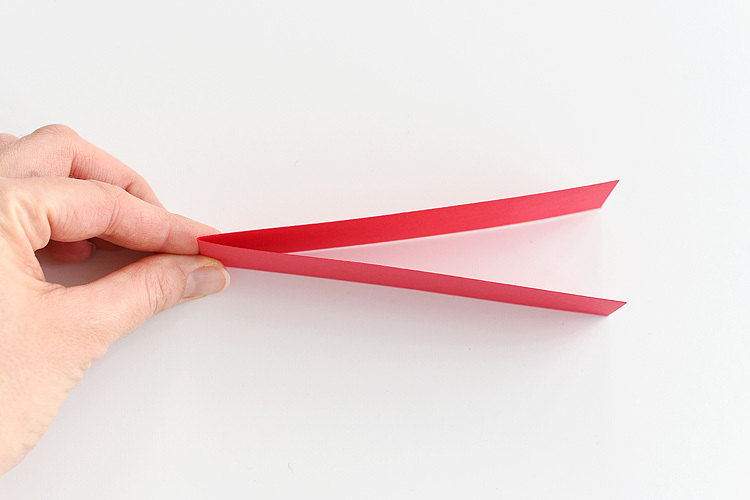 Cut a piece of ribbon about 18″ long. 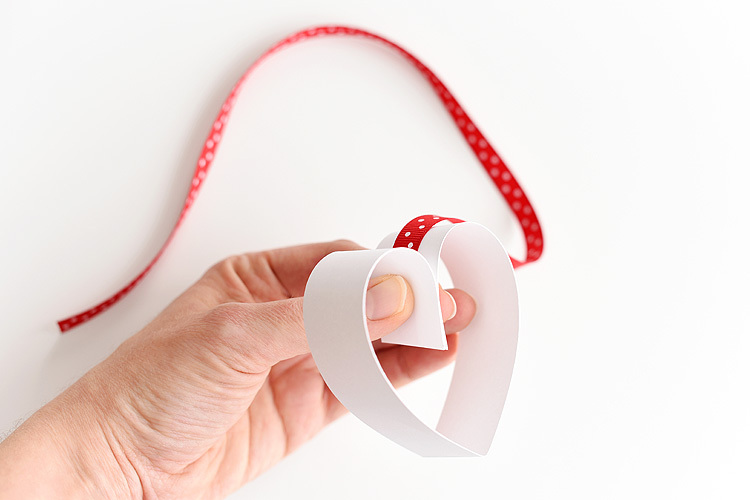 Make your paper heart shape as you did before, but this time slide the ribbon between the two curved ends of the paper. Staple the ribbon and paper in place. 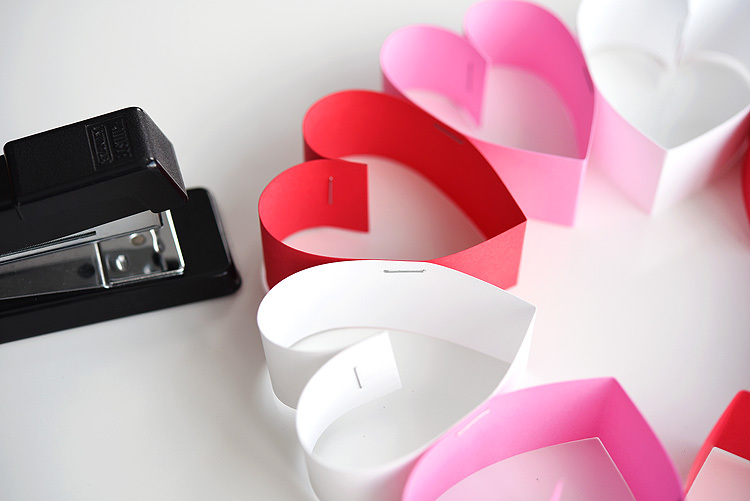 Staple the ribbon into a second heart, making sure you plan out your colour pattern (if you have one). 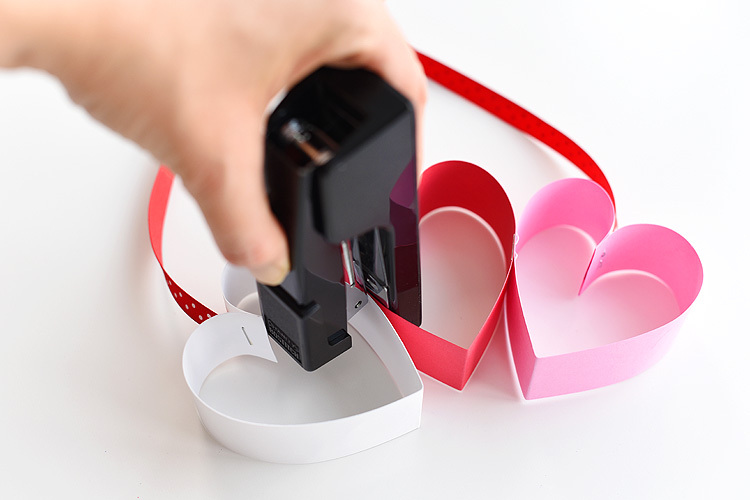 Once you’ve made the two hearts that the ribbon will hang from, go ahead and staple the rest of the strips of paper into heart shapes. 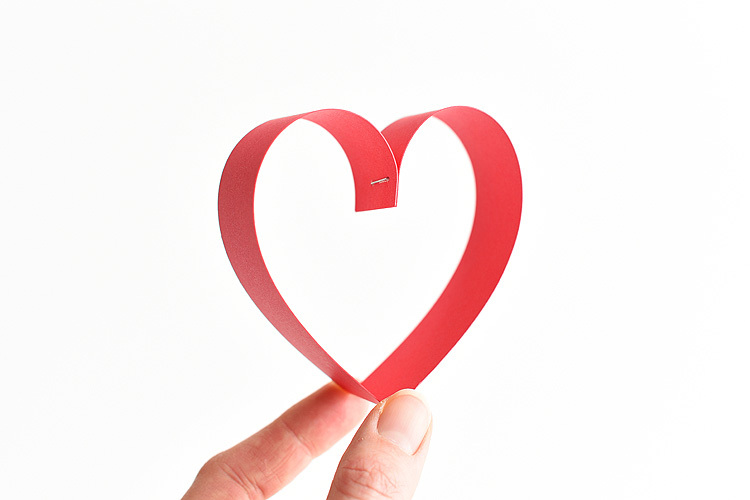 To connect the hearts together, line up the bottom points of two heart shapes, then staple them together about half way between the bottom and top of the heart. 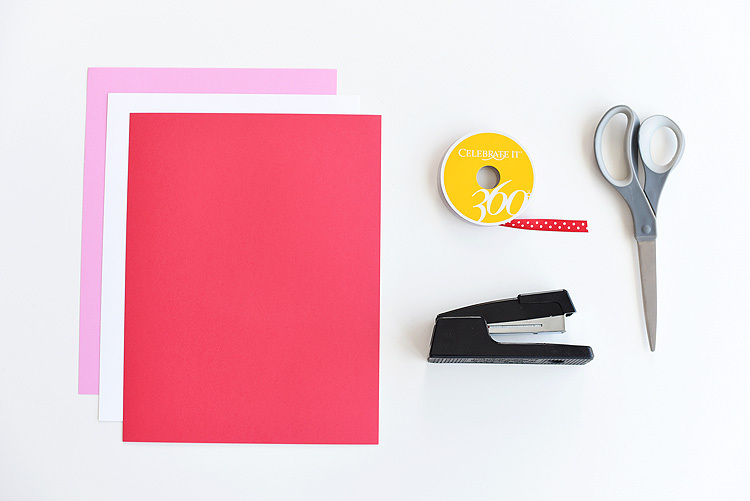 Try to staple close to the back edge, so that the staple isn’t obvious when you look at it from the front. Staple one heart in between the two hearts with the ribbons, again, making sure you line up the bottom points of each heart and stapling half way between the bottom and top of the hearts. 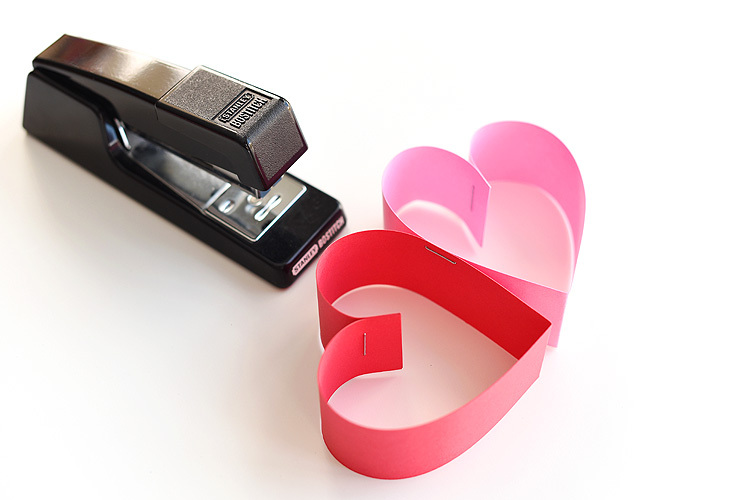 Then continue stapling the hearts together – close to the back edge – until you’ve made it all the way around the circle. 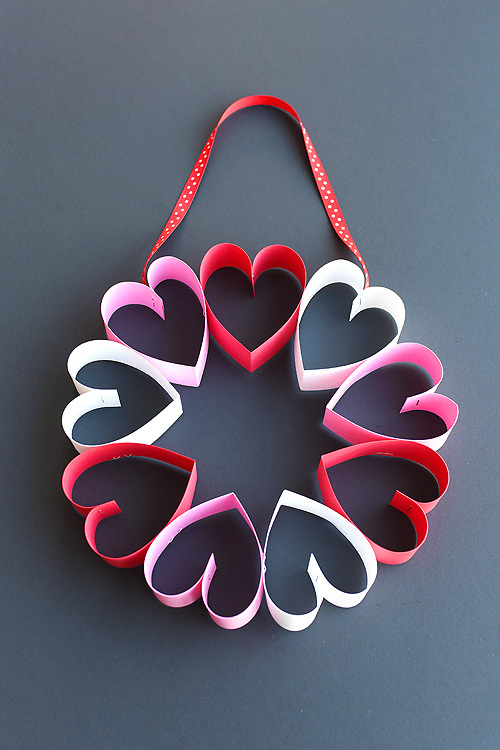 As long as you use cardstock paper and don’t add more than 9 hearts to your wreath, it keeps its shape really well when you hang it up! If you only have construction paper at home, it definitely makes a fun little craft to try with the kids, just don’t expect it to keep it’s wreath shape when you hang it up. I used construction paper for my first attempt (because construction paper packs have the PERFECT red, pink and white colours for Valentine’s day! ), but when I was done it was really droopy when I held it by the ribbon – it was more like a stretched and elongated oval, than a pretty little circle. I definitely recommend thicker paper if you have any. This stapled paper heart wreath is such a fun and EASY Valentine’s Day craft to make with the kids! Seriously, who would have thought that making paper hearts would be so easy!? It’s a great little wreath to hang on a bedroom door (or school classroom door?) 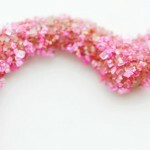 and it makes a super cute and simple Valentine’s decoration! If you’re looking for more fun Valentine’s Day ideas, be sure to check out our Lolly Pop Heart Flowers. 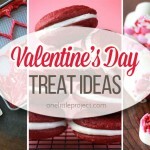 They’re a great (and simple) Valentine idea that the kids can make themselves!